For a few months I enjoyed a brief respite from baby knitting and got to do some selfish knitting. Well...guess what? It's time to break out the baby knits again. Yep. Another round of baby announcements have happened and while I like to think I'm prepared, something in the back of my brain is saying "man, you're going to be SO busy in the next few months". Experience has taught me to pay attention and listen to this part of my brain and I'm thinking I need to get a reverse calendar going and start keeping meticulous lists or else I'll start feeling like a chicken with my head chopped off. Again. I do have a slight head start though, in that I have a few things all ready to gift. Months and months (and months!) ago I had knit a few baby items meant for my cousin's little one. I had finished the knits well before she was due and so these knits just sat there. Waiting. Then she had her little one but by then life and time got the better of me and I ended up not sending her some of these cute wee things and now they probably won't fit, and if they do, it's the wrong season. Oops! Bad, bad knitter!! I completely vow to knit her mini one something über cute for this fall and I promise to send it to her before the summer is over!! In the meantime I have these really adorable sweaters ready for the newest ones to arrive. They haven't been sent to their new owners yet and I'm not worried that this post will ruin the surprise, as I'm pretty sure they're not reading knitting blogs at the moment (they're not knitters). So let me show you what some little cuties will be sporting this fall. It's so darn cute! I thoroughly enjoyed knitting this sweater and I absolutely love how it turned out. The pattern is Flax by Tin Can Knits. It's such a great, quick knit and the smallest size uses only a single skein of worsted weight yarn. But since I'm weary about knitting newborn sizes, I decided to knit the 6-12 months. 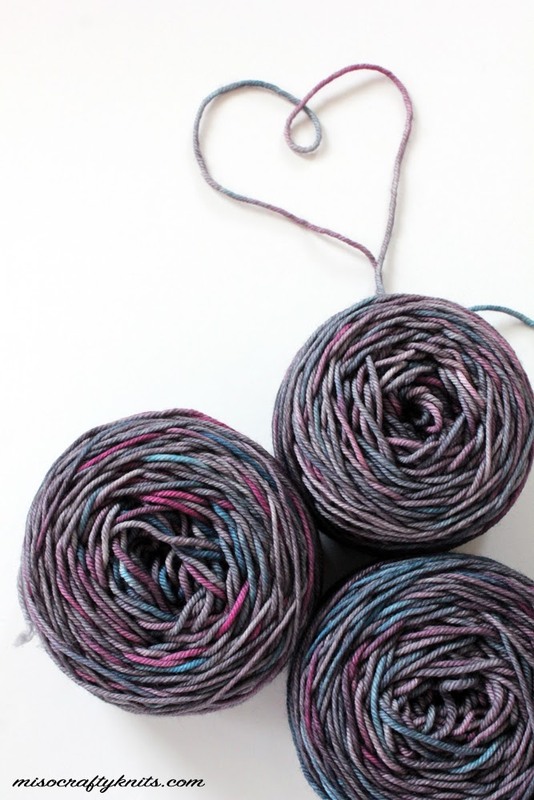 I had a random solo skein of Madelinetosh Tosh Vintage in my stash and knew that I would have to either buy another skein or supplement with a contrasting yarn from my stash. I had the leftovers of Steam Age in Vintage on my desk from my Harvest cardigan (pattern also by Tin Can Knits) and decided to use it for the collar, cuffs, and hem and hoped that it would look ok.
Oh man. The outcome? I LOVE it. I love it so much that I'm thinking I need to do something similar on a sweater for myself! It's a very subtle way of adding in pops of colour and I think overall would be great for either a wee lad or lass. And it was a great way to use up the leftovers of a colourway that I simply cannot get enough of! Aside from the contrasting collar, cuffs, and hem, I didn't do any mods. I did knit the sleeves two at a time because I was nearing the end of the skein and wanted to use up every last inch of the Tern. I ended up having to knit a few rounds in the Steam Age before starting the ribbing, but that's ok. I had knitted a few rounds of the body before starting the hem too, just in case, and I'm glad I did because now it all looks intentional. A part of me wishes I was having another little one so that I can keep this. That's how much I love this sweater! Maybe that's why I'm having such a hard time gifting this? I really enjoyed knitting the first Flax so much that I had immediately cast on for another. I also really liked the idea of using a contrasting yarn that I decided to do it again. This time I'm using a skein of SweetGeorgia Yarns Superwash Worsted in Blackberry for the body and leftovers from a cowl in the Rosebud colourway. 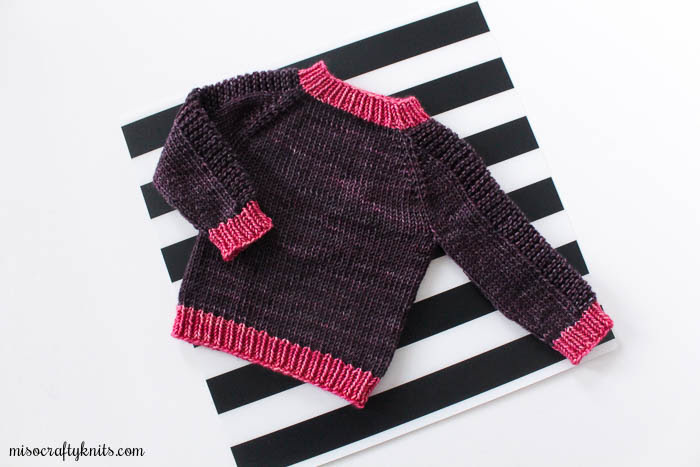 Due the major contrast of colours, I decided to play it safe and knit up the 0-6 months size so that the pink is more crisp and defined as the collar, cuffs, and hem. There's really not much else to say about this project, other than the fact that I can't get over the wee-ness of it. I'm also quite positive that I will be knitting up more little Flaxes in the future. The pattern is so easy peasy - I highly recommend it!! - and every little kiddo I've seen sporting one looks insanely adorable in it. I love this pattern, I love the contrasting hems and I have a confession to make... I have a drawer with a few precious baby girl knits that I may never part with because I love them too much! I think that's where the grey Flax is heading...into a drawer of baby (girl) knits that I can't bare to part with too. Every time I think I'm ready to wrap it up for gifting, my heart strings tug at my brain demanding that I keep it! I love that pattern. I was able to finally see how the jumpers looked on my toddler niece and nephew. They were so cute in their Flaxes! Loved it. You are a generous and lovely friend. Man, something's in the water as they would say. I bet your niece and nephew looked cute!! :) Wee ones are just too adorable. Flax has definitely become one of my go-to patterns for baby knits, I just wish my son wore sweaters so that I could knit one for him!! 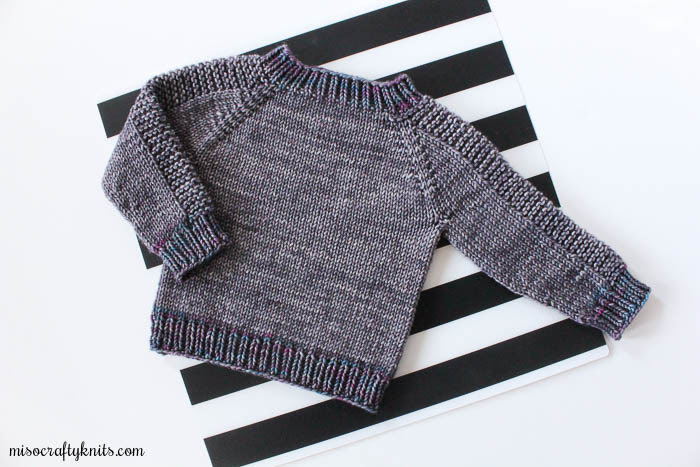 Your baby Flax sweaters are so adorable, I love how different they look with the contrasting cuffs and neckband! And I'm with you about not knitting newborn sizes- newborn fits for about two weeks, when you are totally not going anywhere and they aren't wearing anything but sleeper onsies, and then just when you are ready to start dressing them in cute outfits and taking them out... nothing fits. I love the color combos you've used! The tern/steam age one is especially lovely with its subtlety. Thank you! :) If I can ever find the time to do so, I would love to recreate a Tern/Steam Age version for myself! !